The Geo-Pulse Pressurized “Villa” Flow Center is designed to provide long lasting reliability to your geothermal system. Each Villa is designed to meet the needs of your current project. A pressurized Villa can be designed for small or large systems from (10-500 tons. This geotermal collector allows us to give great performances to the installation of low, medium or high temperature. Geotermal energy has a higher cost than conventional conditioning systems by the cost of use is up to 5 times lower than that produced by gas, oil or air conditioning. Each Pressureized Villa is equipped with a Danfos VLT Variable Frequency Drive which ensures that the Flow Center is operating at premium efficiency by monitoring the feedback from a pressure transducer. The Danfos Drive has a 6 line display that will allow you to monitor performance by Voltage, Hz, Horsepower, or Amps. 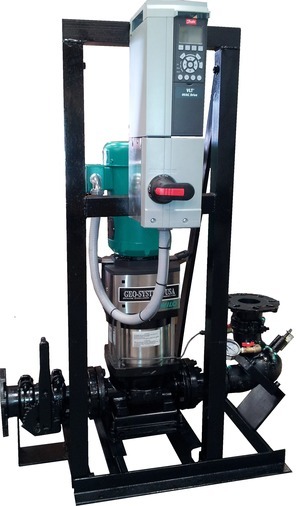 You can also monitor the set point and the actual pressure the unit is currently operating at to ensure that you are getting the correct flow through your system. Programming of the Villa is done by factory trained technicians to meet the specs provided by the customer and is done before the system is ever shipped from the factory making installation quick and easy. A 24 hour customer service line is also available for any questions concerning the drive. The Villa is shipped fully assembled and programmed no assembly required.